The concept of SRE starts with the idea that metrics should be closely tied to business objectives. We use several essential measurements—SLO, SLA and SLI—in SRE planning and practice. These measurements aren’t just useful abstractions. Without them, you cannot know if your system is reliable, available or even useful. If they don’t tie explicitly back to your business objectives, then you don’t have data on whether the choices you make are helping or hurting your business. As a refresher, here’s a look at the key measurements of SRE, as discussed by AJ Ross, Adrian Hilton and Dave Rensin of our Customer Reliability Engineering team, in the January 2017 blog post, SLOs, SLIs, SLAs, oh my – CRE life lessons. When we set out to define the terms of SRE, we wanted to set a precise numerical target for system availability. We term this target the Service-Level Objective (SLO) of our system. Any discussion we have in the future about whether the system is running sufficiently reliably and what design or architectural changes we should make to it must be framed in terms of our system continuing to meet this SLO. Keep in mind that the more reliable the service, the more it costs to operate. Define the lowest level of reliability that you can get away with for each service, and state that as your SLO. Every service should have an SLO—without it, your team and your stakeholders cannot make principled judgments about whether your service needs to be made more reliable (increasing cost and slowing development) or less reliable (allowing greater velocity of development). Excessive availability can become a problem because now it’s the expectation. Don’t make your system overly reliable if you don’t intend to commit to it to being that reliable. At Google, we distinguish between an SLO and a Service-Level Agreement (SLA). An SLA normally involves a promise to someone using your service that its availability should meet a certain level over a certain period, and if it fails to do so then some kind of penalty will be paid. This might be a partial refund of the service subscription fee paid by customers for that period, or additional subscription time added for free. The concept is that going out of SLA is going to hurt the service team, so they will push hard to stay within SLA. If you’re charging your customers money, you will probably need an SLA. Because of this, and because of the principle that availability shouldn’t be much better than the SLO, the SLA is normally a looser objective than the SLO. This might be expressed in availability numbers: for instance, an availability SLA of 99.9% over one month, with an internal availability SLO of 99.95%. Alternatively, the SLA might only specify a subset of the metrics that make up the SLO. If you have an SLA that is different from your SLO, as it almost always is, it’s important for your monitoring to measure SLA compliance explicitly. You want to be able to view your system’s availability over the SLA calendar period, and easily see if it appears to be in danger of going out of SLA. You will also need a precise measurement of compliance, usually from logs analysis. 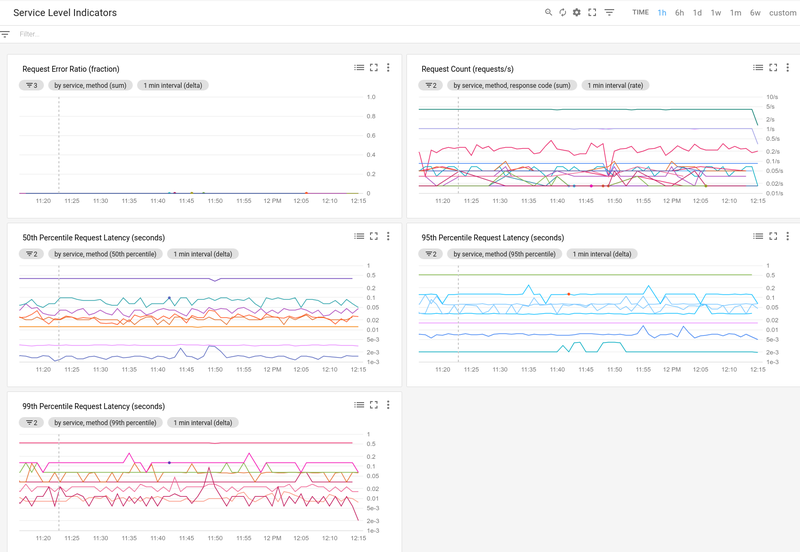 Since we have an extra set of obligations (in the form of our SLA) to paying customers, we need to measure queries received from them separately from other queries. That’s another benefit of establishing an SLA—it’s an unambiguous way to prioritize traffic. When you define your SLA, you need to be extra-careful about which queries you count as legitimate. For example, if a customer goes over quota because they released a buggy version of their mobile client, you may consider excluding all “out of quota” response codes from your SLA accounting. We also have a direct measurement of SLO conformance: the frequency of successful probes of our system. This is a Service-Level Indicator (SLI). When we evaluate whether our system has been running within SLO for the past week, we look at the SLI to get the service availability percentage. If it goes below the specified SLO, we have a problem and may need to make the system more available in some way, such as running a second instance of the service in a different city and load-balancing between the two. If you want to know how reliable your service is, you must be able to measure the rates of successful and unsuccessful queries; these will form the basis of your SLIs.